The Earth Isn't Flat - Fact or Myth? Is the Earth Flat? – How to Tell the Earth is Not Flat and How Do We Know the Earth is Not Flat? It works like this: space is flat, spacetime (3 dimensions of space, 1 dimension of time) is curved, the earth is a curved spinning ball of mass-energy in spacetime created from nucleosynthesis (exploding stars) and held in place by the Sun’s gravitational pull. The Sun’s gravitational pull and Earth’s own mass, spin, and creamy molten center gave/give it a spheroid shape. The Earth’s shape and motion in turn help form the more complex geometry of its surface. Humans have known the earth wasn’t flat since ancient times. Simple tricks for proving the earth is “round” include looking at the horizon or the moon, and changing elevation (at high enough elevations you can see further because the earth curves). Ships seem to appear slowly and disappear over the horizon front first, again because the surface of our planet is curving. As Pythagoras suggested in 500 B.C., the moon is a sphere, so why wouldn’t earth be? TIP: See some simple “how to tell the earth isn’t flat” tricks at Popular Science (we cover many of these below, but it’ll help to check out multiple sources). Is Earth Actually Flat? It’s not, but Vsauce runs through every reason under the curved sun for why it could be (but isn’t). Simple tricks and explanations aside, one can use more complex methods to illustrate the earth’s roughly spherical shape. Here one can use more complex terms to describe that shape by speaking in terms of Euclidean geometry, Minkowski space, and/or fractal geometry, look to the rulesets laid out by the standard model and the cosmological constants, and discuss aspects of engineering and physics. For example, one could point to the fact that any curved surface will look flat from a zoomed-in perspective (just look at elevated terrain on Google maps). Or, one could note telling effects such as the Coriolis Effect which causes air to be pulled left or right in relation to the rotation of the Earth resulting in the air spinning counter-clockwise in the northern hemisphere and clockwise in the southern hemisphere (just look at the global weather patterns, they don’t make sense on a flat earth). Or, one could also start looking at the way the atmosphere bends and refracts light. Or, one could consider timezones (which only make sense if we are discussing a roundish-object spinning a given face toward and away from the sun). Or, one could simply ask an engineer who works on large scale projects (as they must account for the earth’s curvature). The Earth’s geometry and the universe are complex, and there are many hints of varying complexity as to the Earth’s true geometry (some of which we detail below). Why is the Earth Round and the Milky Way Flat? | Space Time | PBS Digital Studios. TIP: This one video debunks every flat earth myth in 15 minutes without even trying. It points out how actual science and engineering factors in things like relativity, equilibrium, symmetry, and geometry. TIP: One thing that seems to trip people up is frame of reference (AKA perspective). From a zoomed-in perspective all curved space looks flat, but looks are deceiving. When building a very large building (one that stretches over roughly 8 miles) engineers have to account for the curvature of the earth, despite the naked eye not being able to pick up on the slight curve. From a theoretical perspective we can muse on some pretty far-out ideas. The universe might be a hologram, and there are even serious theories that postulate that we could be in a virtual simulation! However, despite all the complexity and wonder in these areas, science is pretty clear on the geometry of the earth. The Earth is not a level floating disc (or dome)… that would be the flat earth conspiracy theory which has persisted for years that says that, not any sort of respected science. Unlike the hologram theory and virtual simulation theory, the data doesn’t back up the possibility of a “flat earth” being a possibility. Neil deGrasse Tyson: Flat Earth, Fake Science & Space Exploration. Every time someone believes a flat earth theory Neil deGrasse Tyson sheds a single tear…. which you know balls up into a spheroid shape because of the way general relativity and spacetime works. There are those who argue for a flat earth, against a spherical earth, and for or against every other position one can imagine. Below we cover what our ancestors knew, what we know, and what people think it all means. Read more about the Earth’s Geometry below (including tricks for figuring out the earth is “round”), or jump right in to the actual geometry of the universe. Science is much more rewarding than YouTube conspiracy theories, and we have curated lots of awesome science for you below. With all that said, if you truly think the earth is flat, tell us why without saying the word “Illuminati” and we’ll research your viewpoint. Share your thoughts on the earth’s geometry below. Can You Trust Your Eyes in Spacetime? | Space Time | PBS Digital Studios You can’t trust your eyes in spacetime, but you can trust science. The PBS Space Time series is pretty much the only proof you need when it comes to the geometry of space and the objects in it. Here is the PBS series on spacetime and general relativity, don’t waste brain space on lame YouTube flat earth conspiracies, fill your head with free legit internet science from PBS. TIP: The earth may even be two merged planets (or at least planetoids that crashed into each other at some point in the past). The horizon line moves farther away the higher your perspective is because the earth is round. What is the Shape of the Earth? How Do We Know? The earth isn’t perfectly “round”, but it sure the heck isn’t flat either. The earth isn’t a perfect sphere, the earth is an oblate spheroid with a rough topography. That means it is a bumpy sphere bulging slightly at the equator and thinner towards the poles. The earth has a rough topography due to it’s different elevations, and its “fat” equator helps explain things like why Mount Everest isn’t the tallest mountain. The video below shows what the earth actually looks like via an exaggerated colored gravitational map (the actual earth only has a roughly 13 mile difference in topography between the equator and poles). We don’t see the bumpiness from most photos because of the way perspective works. Our eyes only see a small part of the electromagnetic spectrum, if we saw the whole spectrum and all space and time at once, it would be useless. However, space would be filled with more details, and the earth would look much less round from many perspectives. This can be reconfirmed in the Scientific American article, “Strange but True: Earth Is Not Round“. Real shape of Earth? This video shows an exaggerated version of the shape of the earth using a gravitational map to highlight the fact that planets like earth aren’t perfectly flat or round. The real shape is a little less spherical than it looks from space with a fish eye lens, and a good deal smoother than it is depicted in the exaggerated images shown in the video. The bottom line: The earth is not flat, nor is it domed shaped, it is roughly an oblate spheroid. How Does the Earth Get Its Shape? The earth gets its shape from its spin, wobble, and the affects of “gravity” (spacetime curvature, motion, the molten core, related electromagnetic affects, and the earth’s relative position to other celestial objects). Essentially the earth is in constant motion (linear and angular) around the sun due to the gravity of the sun and the earth (and to some extent other bodies). That constant motion, particularly angular momentum, gives the earth a molten core, shifting crusts, changing tides, and mountainous and rough topography. The core also gives Earth its magnetic poles. The poles help trap the atmosphere. The atmosphere refracts light. Light refraction, relativity, and perspective play at least 200 tricks on our eyes; these 200 tricks have been misinterpreted as proofs that Earth is flat. “The Earth Is Not Round” Neil deGrasse Tyson? The key to realizing the earth is roughly spherical, is understanding that any small section of a curved object will appear flat in small spaces. From our perspective, the earth looks flat. From an flea’s perspective, a beach ball looks flat. When we zoom out of either perspective we see the earth and beach ball are both spherical. When we zoom out the surfaces look smooth, when we zoom in closely we see they aren’t. On a more sophisticated level, understanding why flat earth-ers are wrong (and they are) involves understanding how the atmosphere refracts light, bending it around the earth. Many factors affect our perception of space; atmospheric refraction, relativity including relative motion, special relativity, general relativity, frames of reference (and how they affect light), and the mechanics of the earth’s movement in spacetime (plus other simple and heady physics stuff). The proofs for debunking all flat earth myths require mid-level math, physics, and engineering skills. Given this, the average person can’t just whip out a compass and straightedge ruler and begin debunking the most insidious flat earth myths. In fact, your eyes will tell you the earth is flat from most perspectives because of the way our brains process sensory information. The optical processing of light as “visual information” is used by the brain to create a functional image, not an exact one. Anything the mind deems as unimportant is filled in with useful information (this is why you don’t notice your nose all the time and why memories can be so inaccurate). Don’t trust your eyes, trust science, including the simple experiments below. Feel free to ask any questions in the comments below. See PBS’s SpaceTime series for a great video series on relativity. By the time you get done with the PBS series, you’ll understand why flat earth theories are more BS than PBS. Speaking of which, let us just go ahead and start learning from PBS so we can skip the skepticism and learn some science. Can a Circle Be a Straight Line? | Space Time | PBS Digital Studios. For something slightly more straightforward, check out the equally awesome DNews. The Earth isn’t flat. You are thinking of spacetime, actually, you probably aren’t… but it is. PONDERING: It is likely that the bulk of the flat earth society doesn’t believe in a flat earth. Rather, after research, I suspect they propagate the theory to get people thinking about the actual shape of the earth. Since understanding the earth’s geometry involves opening one’s mind to physics, it is possible the goal of the flat earth mythology is simply to get people thinking critically about science. When Did Humans Learn the Earth Wasn’t Flat? Humans didn’t learn the earth was round during the Renaissance. Our ancestors have known the earth wasn’t flat as early as the first civilizations. This isn’t to say all ancient people or ancient societies understood this, but the technology necessary for demonstrating and using the concept was there. We tend to discredit our ancestors and think they weren’t as smart as we like to think of ourselves as being because we don’t find evidence of certain advanced technologies (like iPhones or something). This is essentially a misconception, we actually find lots of proof of that our ancestors were intelligent (for example the antikythera mechanism, and Egyptian and Babylonian mathematics). Despite past civilizations having this knowledge, we have lost our predecessor’s information many times, for example during the dark ages. Written knowledge either gets translated and passed to the next generation, or it doesn’t. A civilization can have a particular piece of knowledge, without it being the common belief of the time. A large portion of earth’s current population still believes the earth is flat (including the flat earth society). A 2014 study showed 1 in 4 Americans think the sun revolves around the earth. There is no reason to believe that even a majority opinion is correct without proof. TIP: If you want to explore our ancestors knowledge, check out this Yale lecture on technology throughout history. The first lecture examines early humans’ journey from hunters and gatherers to geometry and astronomy. FACT: We know the Babylonians used advanced mathematics and could track the orbit of planets as far out as Jupiter. Later civilizations accomplished great feats, like building pyramids and creating astrological clocks. We have texts from Aristotle’s time. There is lots of evidence to show that ancient humans knew a lot more than some believe. Knowing the Earth is round because you believe scientists is OK, but instead of trusting others let’s just look at all the ways we can tell that the Earth is not flat from Earth and space, with modern technology and without. TOP 10 REASONS Why We Know the Earth is Round. We Can Tell That the Earth is Round even if we stand on it. Ancient civilizations didn’t have rocket ships, but they did have math, eyes, and logic. So we are aware they knew that the earth was round. Here are ways they knew and that you can verify today. All the techniques explained below for telling the earth isn’t flat are simple versions of the actual test. Feel free to look up any in detail. Horizon. Ancient civilizations could tell the earth was round by watching the horizon. You can observe with a looking glass that ships seem to sink below the horizon as they sail out to the ocean. You can then watch them come back. The effect you are seeing is one of a curved planet surface. Even without a looking glass, the only thing preventing you from seeing further on a “flat” ocean, given a clear day, is the curvature of the earth. Shadows. Ancient civilizations that observed lunar eclipses could tell that the earth was round. When the earth blocks the sun from the moon, it casts a round shadow on the moon’s surface. Shadows and Sticks. Ancient civilizations could tell the earth was round by looking at shadows on the ground. Without getting complicated, you can set up identical poles perpendicular to each other a good distance apart on a “flat” stretch of earth. If the earth was flat the shadow’s would be uniform and they aren’t. . The Greek mathematician Eratosthenes estimated the Earth as 250,000 stadia (28,738 miles or 46,250 kilometers) using only shadows, geometry, and logic. This is very close to Earth’s actual circumference of 24,902 miles (40,075 kilometers) if measured at the equator. It’s likely ancient pre-greek civilizations did the same thing. I can easily imagine a person asking, “How far is it from the Tigris to the Euphrates?” Let’s break out the old sticks, shadows, and basic geometry and find out. Constellations. Ancient civilizations knew the earth wasn’t flat because they could see the constellations change as they moved away or toward the equator. Aristotle explicitly noted that the constellations were different in Greece than they were in Egypt. Pendulum. A pendulum won’t prove the earth is round, but it does show the earth rotates (as the movement of a pendulum only changes when it’s base is rotated). If you walk to different parts of the Earth with a pendulum, you’ll get a feeling of spherical shape as the direction of the pendulum’s swing direction will change at different rates for different latitudes. Timezones. Timezones (and light-dark cycles) wouldn’t occur if the Earth were flat. Gravity. Gravity also proves the earth isn’t flat. 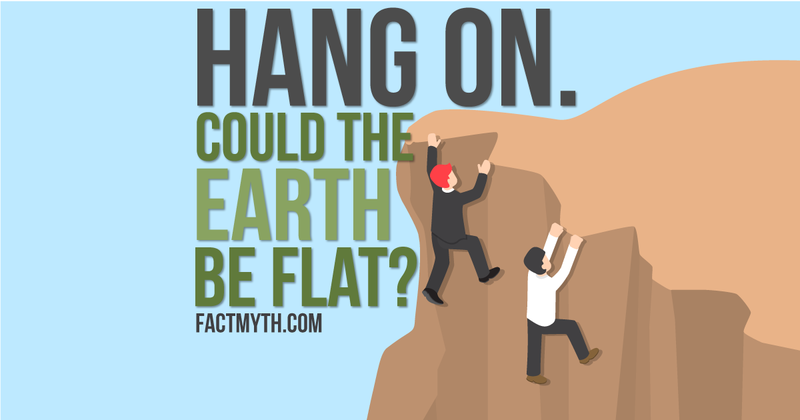 Although they didn’t necessarily know this in ancient times, gravity is (in simple terms) is a result of the earth spinning (and it would behave differently if the earth was flat). Telescope. If you look up at the orbits of planets with a telescope they look as though they have random patterns of motion. This is because the not-flat earth and the not-flat planets are orbiting the sun and spinning. Weather Patterns, Currents, and Fault Lines. A big hint that the Earth isn’t flat is the way the weather patterns, currents, faultiness and other topography connect. There are many ways to know the earth is round from the air and space. They include looking at satellite data and pictures from NASA and looking out the window on a plane. GPS. Your GPS works because satellites orbit around space. Felix Baumgartner’s Red Bull Stratos-space jump FULL POV – Multi-Angle + Mission Data. After flying to an altitude of 39,045 meters (128,100 feet) in a helium-filled balloon, Felix Baumgartner completed a record breaking jump for the ages from the edge of space. There is a fish-eye lens here, but generally, I get the feeling like we should ask Felix himself what he thinks. Physics. Everything we know about physics and the universe shows us that the earth, like all known planets in the universe, is round. Flat 2D surfaces don’t even exist in real life since even very thin things have depth. ALL reputable sources have concluded that the “earth isn’t flat”, and the flat earth society itself is somewhat of an “in joke”, but that hasn’t stopped people from renewing the flat earth conspiracy theories. Flat-earth theories are more popular today than ever. While I refuse to cite these videos as I find the other conspiracy theories mixed into the flat earth theories distasteful, I will debunk the main points of the popular flat earth videos on YouTube below. All the flat earth theories are so off base they are hard to dispute, they don’t address refraction, rough topography, how gravity works (curving spacetime around objects), or relativity. They seem not to understand how modern physics works. The lack of modern physics employed in the flat earth “proofs” is hard to deal with, as the answers to all the “myths” presented can be solved with these tools. Nearly every flat earth proof in the new flat earth videos going around the net boil down to one of these assertions: “they don’t account for curvature when building a bridge”, “we can’t see over the earth’s curve”, “since the earth is moving we should be able to tell”, and, “the earth looks flat from most angles and elevations”. Let’s address those. Why Don’t Engineers Take into Account the Earth’s Curvature? Engineers do take into account the curvature of the earth when building things like large buildings that will span a big enough area. When building railroad tracks, the curve is factored in. Railroad tracks come in small sections, which are fastened together, and gravity pushes the total track with joints toward earth. Bridges are accounted for in the same way buildings and railroad tracks are. The bottom line: Engineers ALWAYS account for the shape of the earth and physics as needed. Why Can We See Over the Curve of the Earth? We can see over the curve of the earth due to refraction of light, the atmosphere, and all other general weirdness associated with light (see the previous link for details). Despite this, we can still see further from higher elevations, assuming we have an even topography. The distance our vision increases from elevation is not particularly noticeable to the human eye, so it makes sense this would throw people off (see next link). Why Does the Earth Always Look Flat, Why Can We Always See the Horizon Instead of Space? Light refraction and our perspective explain why we see the sky and the horizon instead of space. You see space, looking past the edge of the earth, and seeing increasingly far as you ascend into the heavens. You don’t notice this at the time due to the way the atmosphere refracts light, and even if you notice the differences, they are small (see first comment debunking flat earth myths here). Why Can’t We Tell the Earth is Moving? We can’t tell the earth is moving due to the way physics and relativity work. Einstein stated correctly that, “the laws of physics are the same in all inertial frames” (all non-accelerated frames like “standing still” on earth). The moving, but non-accelerating, planet earth is an inertial frame. Just like how if you jump on a 747 plane, you don’t fly backward at 600 mph, you can’t tell the earth is moving because it isn’t accelerating. In short, because of the way physics works, showing the earth isn’t flat takes considerably more evidence than one might expect. But that said, PBS spacetime as a series does a good job at explaining the basic tools you need to disprove the flat earth mythology for good. Curvature Demonstrated + Comments | Space Time | PBS Digital Studios. See other PBS SpaceTime awesomeness here. To be clear, our takeaway on the matter is that the earth isn’t flat, it just looks that way from our frame of reference. Learn more about why small parts of curved surfaces look flat or check out more information on relativity, atmospheric light refraction, or if you want to understand spherical trigonometry. The Earth is not flat, there are lots of simple tricks to confirm this, but skepticism can tear apart any argument made by science. How do we really know we are real? Are we in a virtual simulation? Do we think, therefore we are? Can an equation really tell us something about the physical world? These are all questions of epistemology, cosmology, and other philosophical pursuits. Philosophy aside, we have lots of science that shows the earth is an oblate spheroid and not a flat disc or dome. Spacetime can play lots of tricks on our senses, but science confirms the earth isn’t flat. “How can one prove that the world is round?“. Physlink.com. “Top 10 Ways to Know the Earth is Not Flat“. Smarterthanthat.com. “No, Earth Isn’t Flat: Here’s How Ancients Proved It“. Discovery.com. “Derek de Solla Price “Neolithic to Now” Lecture #1“. Derekdesollaprice.org. “Math whizzes of ancient Babylon figured out forerunner of calculus“. Sciencemag.org. “Figure of the Earth“. Wikipedia.org. “New Survey: 1 in 4 Americans Believe the Sun Revolves Around the Earth“. Discovermagazine.com. “What is the simplest way to prove the Earth is round?“. Physics.stackexchange.com. “Why can’t an airplane just fly into space? Why do we need rockets?” Nasa.gov. flat and round earthers are both crazy and take it to the extreme. You can’t see the curvature from a plain either. The shape of the earth is ugly and prob the reason they are no real pictures of it. From space it looks flat but is shaped more like a deformed pair. You misunderstand, this site is meant to dig towards the truth. Your viewpoint has been added to the page. The more details, the more helpful it will be to the next reader. Indeed. That is what I was thinking to myself as I wrote this. It isn’t easy to explain, and for every explanation a flat earth-er has a comeback, but I think a few of the points (like needing to account for curvature when building large structures helps to hammer in the point. There is a theory that some flat earth people push the theory to get people thinking on a deep level, as it takes some smart and knowledge of engineering and physics to rebute, but then I turn on a flat earth video and see them spouting off anti-other-people viewpoints and think to myself “perhaps they aren’t being so clever and are more just being conspiratorial”. I’d love to understand them better, just the logic, not the divisive rhetoric. i must say that All arrows of proof point to the Earth having a definate curvature and it being closest to spherical planet. Maybe you can look into these subjects and use the many examples i see made evident with the day-to-day, yet unseen world of Radio Frequency Radiation?? Have a great day & GOD Bless You! Thank you for the insight, I wouldn’t have thought to research that without being prompted.